As is customary, CanTech The Grand Tour began on Monday 25 March, with the tabletop exhibition hall. With a ratio of 50% can maker to supplier, attendance far surpassed last year’s Euro CanTech in Milan, Italy. After the tabletop session, the show began with a networking dinner, where delegates were able to sample some of the culinary delights of Istanbul, which was warmly received. 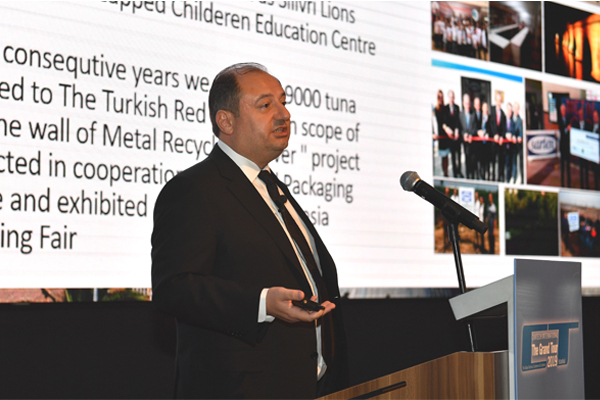 Sarten Ambalaj CEO Zeki Sarıbekir, began proceedings on day two of The Grand Tour, with the keynote speaker slot. Sarıbekir told the participants the story of Sarten, which started in 1972 and has subsequently reached 2,600 employees in 18 factories today. Sarıbekir said that the packaging industry in Turkey is very strong, citing the geographical location of the country as a major advantage. 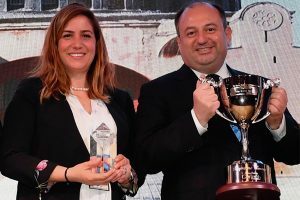 Sarıbekir commented that Sarten is the biggest producer in the MENA region, which includes Turkey, as well as the Middle East and North Africa, adding that: “We rank in the top 10 metal packaging producers in the world, and in the top three in Europe. 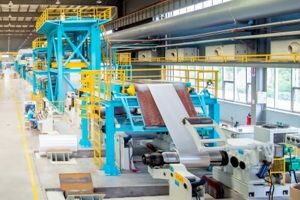 Sarıbekir said their traditional mission to provide high quality, fast, environmentally-friendly and affordable service provided a steady and sustainable growth, adding that their use of tin material would reach 200,000 tons by 2020. Sarıbekir concluded that the packaging industry in Turkey is very strong, and that there is a great advantage in terms of Turkey’s geographical location in particular. It is possible to make delivery within two days, not only in Europe, but also in most parts of the Middle East. Additionally, there are also diverse transportation possibilities for Africa, the rising star of late. SLAC’s board director Richard Moore presented on ‘when to go digital in metal packaging’. He commented on how digital printing is already at mass market level, at 27% for labels already, and moving into other mass markets. Tetra Pak has recently announced it’s going into digital printing, but metal packaging has been slow on the uptake, with only around 1% of all cans printed digitally. Moore expressed how we are seeing a fragmentation of demand, shorter runs and print times, tighter supply chains, low stock holding, and the need to react quickly to the change in demand. Conventional lines are not well adapted to short runs, which means high cost for short runs, and many can makers demanding a minimum run of about 80,000 cans. The solution, he says, is a digital printer, with no changeover time, no downtime, no changeover plates, and the ability for one can one design. To integrate into a beverage can line, SLAC has developed a mini line concept, centered on the SLAC digital printer, where the basecoat is applied prior to digital printing. This is said to bring down the DWI threshold, and opens the market for craft beer, short runs and artisan drinks. Carolyn Crouch of Stolle Machinery updated the industry on its new Die Necker. The new Stolle Die Necker Machine is designed to neck two-piece cans to accept a specified diameter end. In addition to necking, the machine can be equipped with modules to perform other processing functions on the cans, including flanging, base reforming and light testing. Cans enter the machine through an infeed module that includes two starwheels, an integral waxer and an optional vision inspection camera to perform 100% inspections of cans within the machine. Day two concluded with APEAL’s Tony Waite, president, and Alexis Van Maercke, secretary general. Both speakers provided the latest on APEAL’s approval of European Commission’s REACH committee to agree to authorise the continued uses of chromium trioxide for the passivation of tinplated steel (ETP), and for the manufacture Tin-Free Steel / Electrolytic Chromium Coated Steel (ECCS). Chromium trioxide is used globally in the steel for packaging industry as a treatment to stabilise the surface of tinplated steel, and to manufacture ECCS. It is not present on the surface of the final material used for the manufacture of steel cans. The REACH committee agreed with the draft decision of the European Commission granting the use of chromium trioxide for ETP and ECCS, with a four-year review period. Elsewhere, Waite provided a strong message of support for the steel industry, with a number of positive PR messages the organisation has fronted, including the #LoveSteel campaign, and the 79.5% recycling rate of cans in Europe. This has put the industry in a strong position, and well positioned for the new EU waste legislation which is upcoming. Day three’s highlight was Ania Krolak, managing consultant EMEA, specialising in packaging at Smithers Pira. Krolak presented on the overall health of the metal packaging industry, and covered the fundamentals of Smithers Pira’s The Future of Metal Packaging and Coatings to 2023. According to Krolak, the global metal packaging and coatings market is valued at almost $105.5 billion in 2018. Total value is forecast to increase at 1.6% year-on-year to 2023, pushing overall value to $114.4bn. Much of this figure can be attributed to beverage cans that continue to dominate the market, holding a share of almost 45%. Although global demand for beverage cans has been affected by falling sales of many forms of carbonated drinks, it has also benefited from the surging popularity of energy drinks and craft beer. Future growth in demand is likely to come from packaged water, wine and RTD (ready-to-drink) tea and coffee drinks. 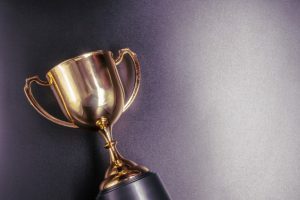 Asia will remain the best-performing region within the global metal packaging market in the period leading up to 2023. During this time, value sales are anticipated to increase by more than 18%, as the region overtakes North America to become the world’s largest.